Remember my recent post about finding a Dr. Seuss 2010 calendar? At first I couldn't figure out the identity of the book featured in the September layout. Turns out it was Dr. Seuss' If I Ran the Circus. Now here's a coincidence! 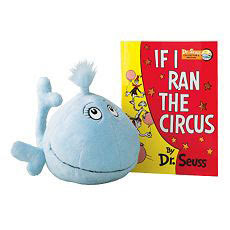 I just noticed that the new Kohl's Cares for Kids book collection features four Dr. Seuss titles along with corresponding plush characters: If I Ran the Circus, The Lorax, The Foot Book and Oh, the Thinks You Can Think. At only $5 each, we will be adding these titles to our home library collection very soon! And, according to the Kohl's website, "100% of the net profit from the sale of these items will support health and educational opportunities for children nationwide." We do love the Kohl’s Cares for Kids program. What is your favorite Dr. Seuss book? For me, it is a toss up between Green Eggs and Ham and Horton Hatches the Egg. Love these! I buy them all the time for school! They go really nicely on my bookshelves. I got all but the guy from The Foot Book the other day. They were all out! I LOVE the Kohl's Cares for Kids project. They seem to always have wonderful books at such great prices. It's the perfect way to add to home library when you're on a budget and it helps a good cause. Thanks for the tip! I will have to take a short trip this week some time. I love Kohl's for Kids! We got some when they did the Grinch! I'll have to look for them again this year . . . Favorite Seuss - so hard - probably Cat in the Hat. There was a time when I could recite it from memory to console the wailing toddler in the back seat.